“They’ll say they won’t interfere with us, but sure enough on a blue powder day, they’ll be right there poaching that line right above you,” said Toby Schwoerer, a longtime backcountry skier in the area who opposes the plan. But the founders of Hatcher Pass Mountain Guides say their goal is getting away from people, in part to avoid competition for pristine slopes in the Talkeetna Mountains northwest of Palmer. They say the area is not as busy as people think, and they plan to focus on safety. “We really want to be operating far away from the public,” said Adam Cuthriell, a mountain guide for the company who lives in Girdwood and Willow. Along with a third business owner — Farley Dean, Bryce’s father — the men have applied for a five-year land-use permit from the Alaska Department of Natural Resources. They hope to start operating next winter. If their application is successful, they’d run the first snowcat-skiing operation in Hatcher Pass in more than a decade, and the first heli-skiing operation in more than 30 years, say people familiar with the area. The proposal has sparked opposition, and some support, on social media sites. The state announced Wednesday that it would extend a planned two-week comment period. Originally set to end Tuesday, the comment period will now last until May 2 at 5 p.m.
A map of the proposed area of operations released by the state has led to misconceptions about where the company will take clients for skiing, Cuthriell said. The snowcat will pick up skiers and snowboarders along Fishhook Willow Road, such as near Hatcher Pass Lodge, he said. 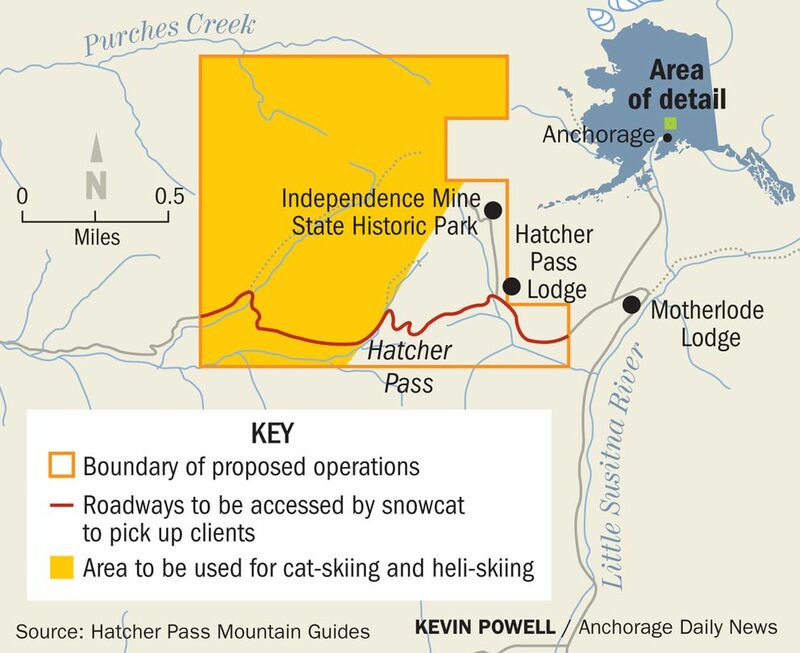 Because of that road pickup, the permit boundaries on the map encompass some of the busiest areas at Hatcher Pass, including Independence Mine, Hatch Peak and Skyscraper Mountain, across the road from the lodge. But the clients won’t ski in those areas, or in any areas designated as “non-motorized” in the Hatcher Pass Management Plan, he said. They will ski on state land, but not state park or private land. The snowcat will ferry the clients, in groups of up to eight with two guides, to harder-to-reach areas west of Skyscraper Mountain, Cuthriell said. The helicopter, flying out of Talkeetna and operated by Talkeetna Air Taxi, would pick up snowcat customers, two at a time, who pay extra to reach more remote terrain. “The helicopter will never operate on the Palmer side of (Hatcher) pass" where it’s busiest, "or near the parking lot areas,” the application says. 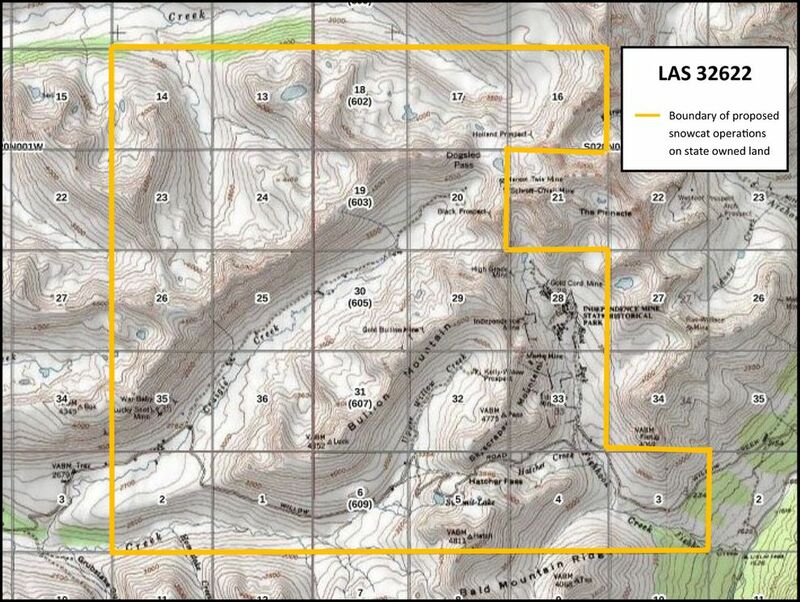 Helicopter pickup sites could include the bottom of Bullion ridge — west of Skyscraper Mountain — or the base of the bowl in the Dogsled Pass area, north of Skyscraper, the application says. Cuthriell expects that most helicopter operations will occur on the west side of Bullion Ridge, farther away from people. But depending on conditions, there’s a chance the helicopter could pick up people on the eastern flank, he said. Billy Finley, a longtime backcountry skier in the area from Anchorage, said both sides of Bullion Mountain are popular destinations for snowmachiners and skiers. He said the Dogsled Pass area gets busy too. “The idea that a helicopter could land there and discharge clients in an area that’s packed with people doesn’t seem safe,” he said of Bullion Mountain. Karl “Hap” Wurlitzer, 82, said a heli-skiing business last operated in the area in 1986, plucking skiers from near Hatcher Pass Lodge, which he’s owned for decades. The company gave rides to Hatch Peak for $15 a head. Wurlitzer said he might support a short operating season late in spring, perhaps for a month, when bright days improve visibility and flight safety. But he said guests who stay at his cabins for an “easygoing” experience won’t like hearing the helicopter, even if it’s not nearby. “They start throwing around more noise with a chopper and that would be problem with me,” he said. Miles Raney, who lives near Hatcher Pass and skis there, said he doesn’t want to oppose the idea but he’s “not psyched about it.” He worries helicopter and snowcat skiing will ruin the wilderness experience and boost avalanche risk. “It’s just going to be a cluster and I hope no one gets injured,” he said. The company says avoiding and forecasting avalanches will be “of the highest priority.” Precautions will include regular testing and monitoring of snow conditions and twice-daily briefings between guides and vehicle operators. Farley Dean said the helicopter can provide an extra measure of safety, providing rescues for any backcountry user in danger. 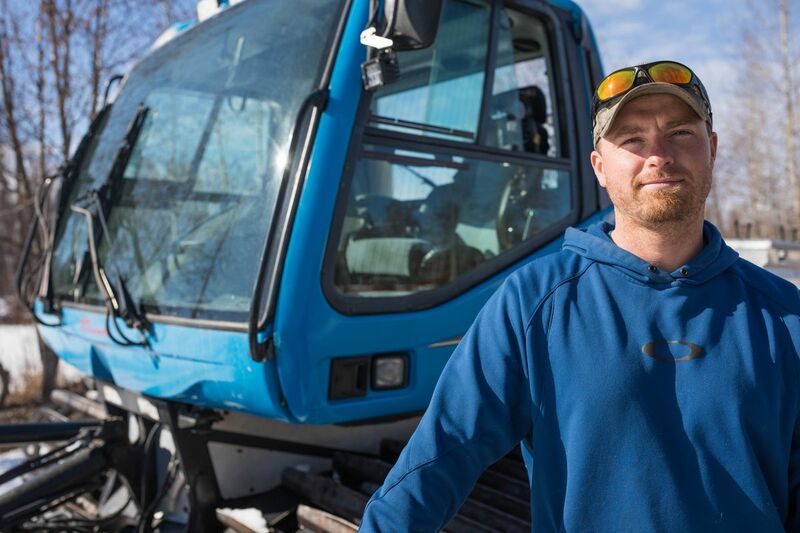 Bryce Dean, who also owns grooming company Snowcat Services of Alaska, said the area is not as busy as people think, especially on weekdays. He has a state contract to groom most of the trails in the area, using the snowcat he’d use for the guiding business, he said. Last Friday he groomed from Hatcher Pass Lodge, where he keeps the snowcat, to the Lucky Shot Mine area.